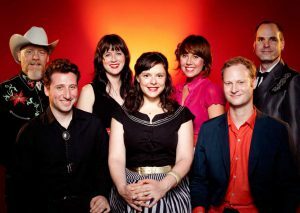 The Golden Horse Ranch Band – Tell your Ma & Pa you'll be home late tonight! Tell your Ma & Pa you'll be home late tonight! This year’s beautiful poster is by Daniel Rathbun. We’ll have copies available at the shindig. It’s time again for the best dance of the year! 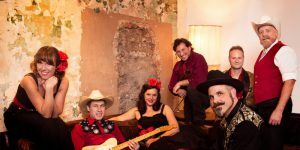 Shake off the Holidays and come on out to the 14th Annual Barn Dance Apocalypse Featuring the Golden Horse Ranch Band at Chicago’s Thalia Hall. Square dance, contra, line, 2 step, polka, and waltz the night away to the Golden Horse Ranch Band. It doesn’t matter if you have 2 left feet, or only one foot left. We’ll teach you everything you know! Come alone or bring a partner! Just be sure to dress for the occasion. If you’ve been before, you know how magical it is, so tell all your friends! If you haven’t been before, get ready for a western wonderland of dancing with friends and strangers (a.k.a. friends you haven’t met yet). Yes, ladies and gents, when the rapture comes, we’ll all be dancing! 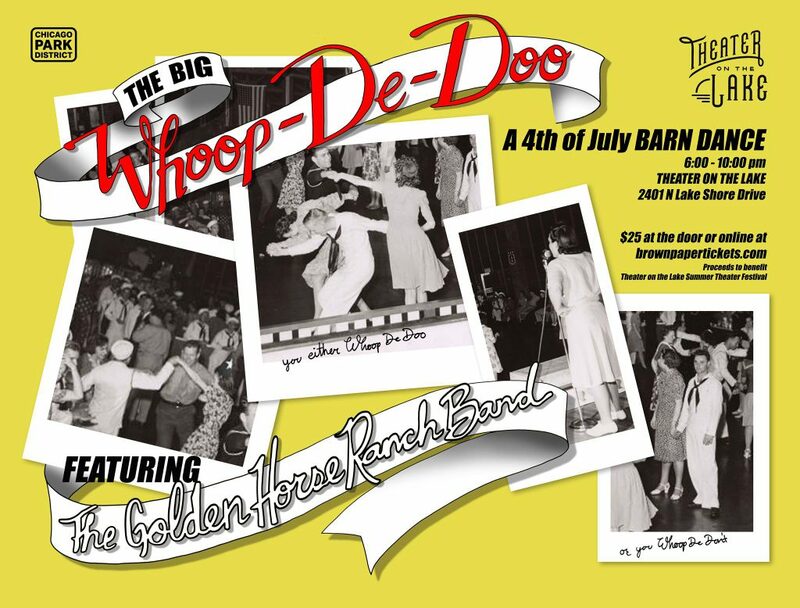 The Golden Horse Ranch Band are pleased to be playing a 4th of July shindig at the newly renovated Theater on the Lake in Chicago. Come dance with us, and then stick around for a lakeside view of the fireworks. 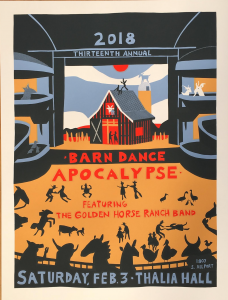 Ethan D’Ercole’s poster for the 13th Annual Barn Dance Apocalypse. Click to embiggen. 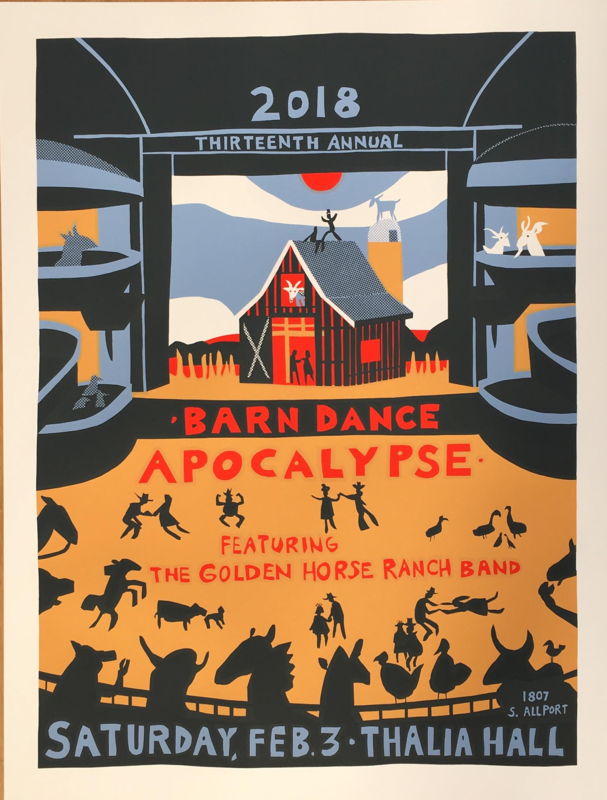 Behold Ethan D’Ercole’s lovely poster for the 13th Annual Barn Dance Apocalypse. We’ll have some on hand at the shindig if you’d like to purchase one as a souvenir. The event is going down on February 3rd at Thalia Hall in Chicago. The 13th annual Barn Dance Apocalypse is going down February 3rd at Thalia Hall. Don’t be late! 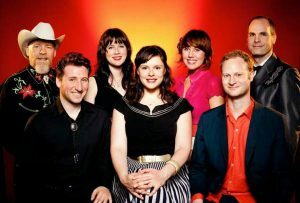 Come square dance, contra, line dance, polka, and waltz the night away to the locally-sourced-organic-bourbon fueled spectacle of Golden Horse Ranch Band. It doesn’t matter if you have 2 left feet, or only one foot left. We’ll teach you everything you need to know! Come alone or bring a partner! Just be sure to dress for the occasion. Yes, folks, when the rapture comes, we’ll all be square dancing! 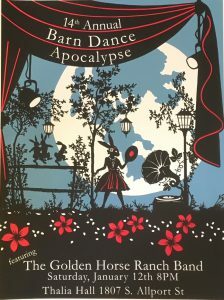 Poster for the 12th Barn Dance Apocalypse, by Chris Hefner. Click to embiggen. Behold Chris Hefner’s poster for the 12th Barn Dance Apocalypse. We’ll have copies available at the shindig if you’d like one of your own. Tickets for the 12th Barn Dance Apocalypse are on sale now. The 12th Barn Dance Apocalypse is going down at Thalia Hall on February 4th, 2017. Tickets are on sale now. Get yours early, before it sells out. 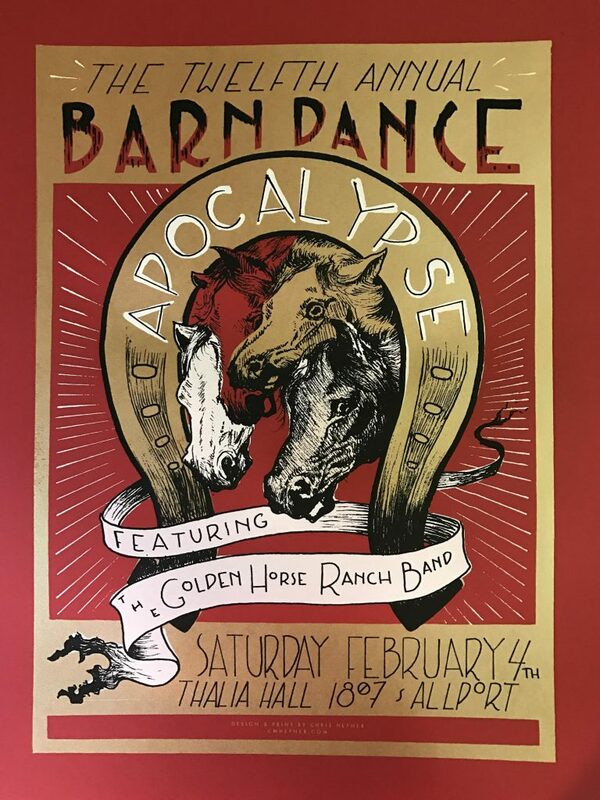 The 11th Annual Barn Dance Apocalypse poster by Ryan Duggan. Click to for ticket info. 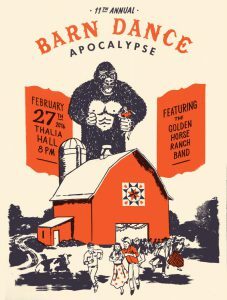 The 11th Annual Barn Dance Apocalypse is going down February 27th at Thalia Hall in Chicago. Ryan Duggan has created a poster to help get everyone in the mood. We’ll have copies for sale at the dance if you would like to take one home as a souvenir. The Golden Horse Ranch Band and Thalia Hall will be winding Craft Beer Week down with a celebration of its oft-maligned sibling, crap beer. There will be dancing. There will be $1 beers.